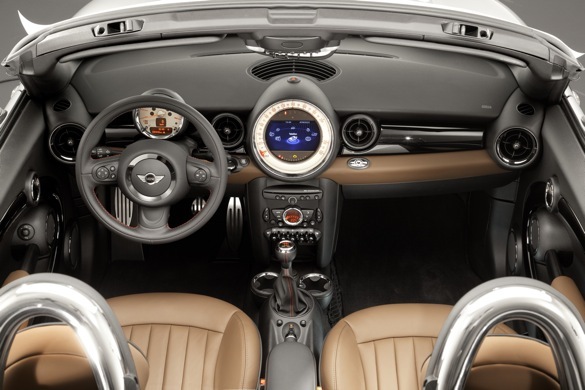 We’re not fans of the MINI Coupe’s backward-baseball-cap styling, which we frankly just find goofy. The car may be a blast to drive (but we wouldn’t know, since MINIs in the press fleet are rarer than ethics in politicians), but sooner or later you have to park it. Getting out, eyes averted, while nearby pedestrians point, snicker and laugh out loud is something we just can’t get used to. 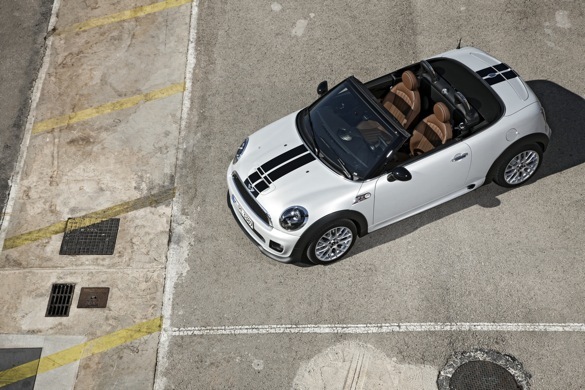 The new MINI Roadster, on the other hand, escaped its beating with an ugly stick. If fact, we’d go so far as to call it the best-looking car in MINI’s current lineup, even with the top in place. The proportions (small though they may be) seem just about right, and we’ll bet that the Roadster will carry on MINI’s tradition of building front-drivers with surprisingly capable handling. As with most MINIs, the new Roadster comes in mild, medium and spicy flavor, with prices to match. 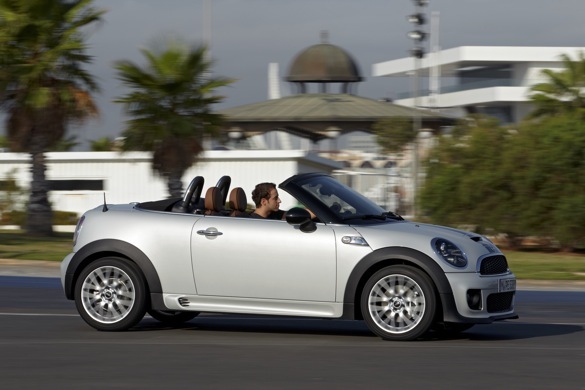 On the entry-level side is the base MINI Cooper Roadster, which gives you a 121-horsepower engine and a 0 – 60 time of just under nine seconds, for a price that starts at $25,050. 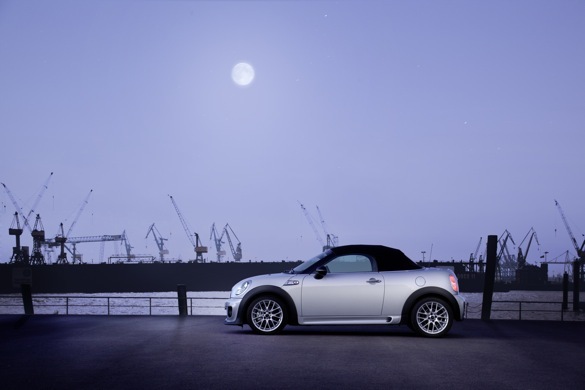 Moving up the line, the MINI Cooper Roadster S gives you a stiffer suspension and more horsepower, courtesy of MINI’s TwinPower Turbo design. For a price of $28,050, before adding options, you get 181 horsepower and a 0 – 60 time of 6.7 seconds. Top speed increases from 124 mph in the base Roadster to 141 mph in the Roadster S.
If spicy is your preference, you’ll need the MINI John Cooper Works Roadster, which gives you 211 horsepower from the same 1.6-liter four found in the other cars. You also get bigger brakes, improved aerodynamics and standard Electronic Differential Lock Control (EDLC), which is optional in the other cars. The increased horsepower nets you a 0 – 60 time of 6.3 seconds, on the way to a top speed of 147 miles per hour. You’ll pay for the improvements, though, since the base John Cooper Works roadster starts at $35,200. The MINI Roadster will often be cross-shopped against the Mazda MX-5 Miata, which yields performance similar to the Roadster S. Opt for an MX-5 in Grand Touring trim, and the price (before options) is a comparable $29,000. On the other hand, a John Cooper Works Roadster starts at $35,200, and will easily top $43,000 with options added in. A loaded Mazda MX-5 Miata, with the power retractable hard top, stickers at a more reasonable $32,640, which leaves you over $10,000 for a Cosworth supercharger, suspension work and stickier tires. 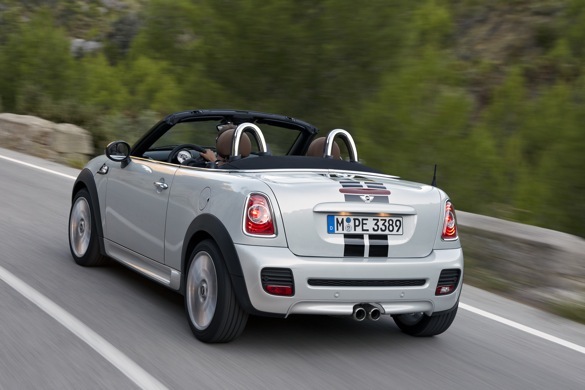 The upcoming 2012 MINI Roadster model’s first spied snaps are out. This model looks like that of the MINI Roadster Concept debuted by the same manufacturer at the Frankfurt motor show in 2009. Hence it has got so little camouflage. But it sports some camo on the rear end. comes equipped with a double-piped, center-mounted exhaust along with. The rear bumper grill has also got extra set of lights on it. The front of the vehicle has got rounder lines than on the Cooper model. The windshield in particular, looks shorter and more sloped. It also appears to be curvier from A-pillar to A-pillar than on the Cooper. However, we could not make out what exactly is the automaker trying to hide with that camouflage at the backside. 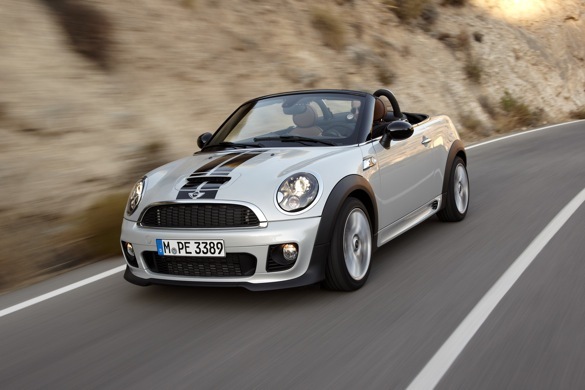 The 2012 MINI Roadster will make its debut later this year.